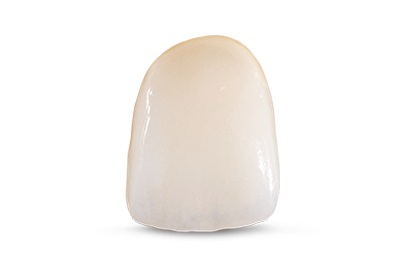 IPS e.max® is a lithium silicate glass-ceramic fabricated for one-piece, full-contour metal-free restorations. The material is highly translucent and stronger than porcelain with an average flexural strength of 400 MPa. IPS e.max can also be cut back for a ceramic veneer for ideal esthetics. Indicated for full anterior or posterior crowns, veneers, inlays, onlays, and three-unit bridges having only one pontic with the second bicuspid as the most distal abutment. IPS e.max is the premium lithium disilicate, glass-ceramic restoration. Combining lifelike materials and fracture resistant properties, IPS e.max is as durable as it is lifelike. The flexibility of IPS e.max makes it an excellent restorative method for anterior esthetics or posterior function. Bridges which include molars, Maryland style bridges, and bridges which have a short vertical height that does not allow for adequate connector height. Posterior full-coverage crown requires a chamfer or shoulder margin. A circular shoulder is prepared with rounded inner edges or a chamfer at an angle of 10-30°: the width of the shoulder/chamfer is approx. 1 mm. Occlusal reduction is 1.5 – 2 mm: axial reduction (buccal, lingual, and interproximal) is 1.5 mm with rounded internal line angles. IPS e.max layered – can be cemented using a resin reinforced glass ionimer such as RelyX Luting cement. Or bonded using a resin cement when extra strength is needed due to lack of retention on the prep, use a resin cement such as RelyX Unicem or RelyX Ultimate. If adjustments are needed, use fine diamonds with water and light pressure. Always remove the crown when adjusting or bond/cement crown before adjustments are made. ).